1 degree = 60 arcminutes = 3600 arcseconds. The full moon measures about 0.5 degrees so the full Moon is about 30 arcminutes or 1800 arcseconds in diameter. A Vixen LVW 22mm (42 arcminutes) would show the full moon in my scope plus a little extra. 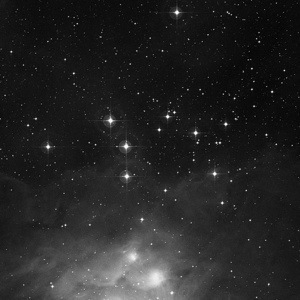 This image is taken from DSS and shows the open cluster, NGC 1981 in Orion. The image is 42 arcmins across and is representative of what I would see using a VLW 22mm eyepiece.The upper part of NGC 1977 “The running man” nebula is visible in the lower part of the image.